As the dust begins to settle after a month of nonstop Sonic action, we can begin to look back and process the flurry of excitement that was April. 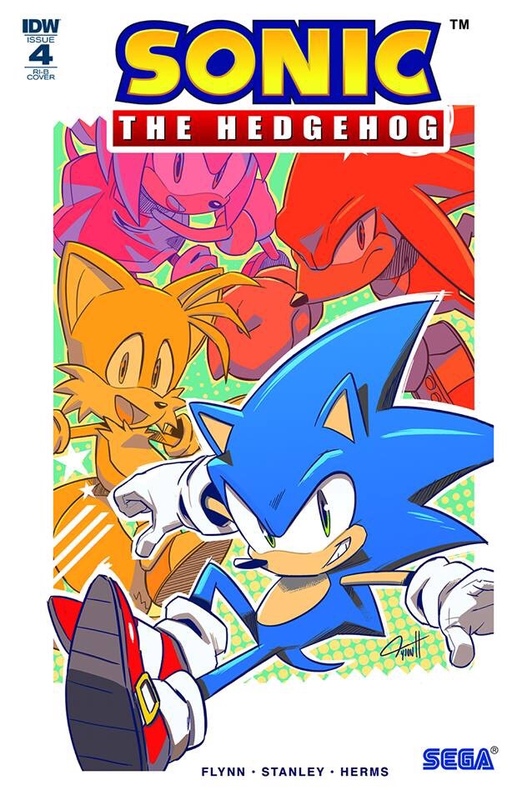 If you missed the hype train, Sonic has made his triumphant return to the comic world and found a new home at IDW Publishing. While I primarily set out to merely review the Fallout story arc, I could not help but also reflect on the events that lead up to it. The long history with Archie, the tragic break up, and the triumphant return with IDW. If you just want to see my thoughts on the Fallout arc, feel free to skip past the first section, but if you are a fan like I am, you might enjoy reflecting on the journey that got us to this new place! Last year, many fans were heartbroken when SEGA officially confirmed what many had feared: It was parting ways with Archie. Archie’s run was almost as old as the Blue Blur himself, and many fans were heavily invested in the deep, expansive world and the host of characters that inhabited it. However, legal issues with some of the creative team caused significant problems for Archie, and SEGA finally decided to withdraw the license and quietly negotiated giving it to IDW, a company better known for its successful licensed comics. Two new editors were brought in to oversee the new license: Joe Hughes, a comic industry veteran who has worked for ComicsAlliance and Vertigo, and David Mariotte, son of former IDW editor-in-chief, Jeff Mariotte, who has grown up in and around the comic industry, has stepped up to continue the family legacy. Wisely, they put together a team of Sonic veterans eager to continue working with the beloved IP. Writer Ian Flynn and artist Tracy Yardley are perhaps the two most recognizable names from Archie’s modern run. After that it was a deluge of other familiar names: Tyson Hesse, Matt Herms, Adam Bryce Thomas, Jen Hernandez, Evan Stanley, Jonathan Gray, Jamal Peppers, and Rafa Knight to name a few! Not only that but they snagged an undiscovered talent to make some awesome cover art, Nathalie Fourdraine. With so many Sonic veterans on board, fan confidence was bolstered, and once Sonic returned to comics, it almost felt like he never left. Going above and beyond, the editors established the IDW Sonic Comic Squad Facebook group where they tapped into the pulse of the fan base. A community quickly arose with David and Joe actively participating in it, effectively garnering interest in the new book and increasing the hype with their involved and responsive interactions with the fandom. Beyond the exclusive reveals members gained, there is just something extremely gratifying about asking a question about the book and having it answered by one of the editors themselves, often only moments later. It is apparent that they have their ears to the ground and are listening to the fan base, and that is a truly a beautiful thing. Speaking of questions, perhaps the most reiterated one was, of course, regarding the fate of the Freedom Fighters. As I said before, many fans had grown up with the comics which provided a depth of story to which the games could not compare. Attachments run deep, and for many, a Sonic comic without the Freedom Fighters would not be a Sonic comic at all. Ignoring the obvious logical shortcomings of such a sentiment, it was a real concern for many long-time fans, and some would not rest until they received the answer they wanted. It was asked so much and so often, that it became obvious that the team had begun pointedly ignoring the question altogether. However, Joe Hughes finally confirmed that the Freedom Fighters would, at least, not be appearing in year 1 of IDW’s Sonic the Hedgehog. While this answer did not possess the finality many were hoping for, it seems to have nonetheless appeased the masses for the time being. Looking back at the first 4 issues, I do not miss the Freedom Fighters. That is not to say I would not love to see them return in some form. What I mean is this book is not lacking sans Freedom Fighters. If nothing else, the first 4 issues were so heavily focused on establishing the characters, that I am excited to see more of them. I want to see how Tails and Amy’s apparent growth affects their characters. I want to see the development of new characters like Rough, Tumble, and Tangle. Sure, I miss Bunnie and Antoine, but we have such a feast on our plate already that I do not think we will be hungry for more any time soon. That being said, let us reflect on the wonderful new world Sonic and his friend now inhabit. In some ways it’s completely brand new, in other ways, it feels just like home. First and foremost, four issues in one month is both ambitious and brilliant. It accomplished several things. 1) It saturated the market with content, giving fans a huge dose of the new product allowing long time fans and newcomers alike to get a good feel of what the new book will be like, 2) it allowed IDW to show off the work of several different artists, granting a peak at a wide swath of their talent to newcomers; as well as appealing to established fans by showing off all the veterans returning to the series, 3) it gave Flynn the latitude to be able to focus on action and character building without it feeling like he was sacrificing plot or world building too much, 4) and it lined up the issue numbering perfectly with the calendar months. There were some slight draw backs, however, it was apparent that some of the artists may have been slightly rushed to produce content on a certain timeline, and the art suffered at points as a consequence, but that is a small and relatively worthwhile trade-off for what we received. Overall, it was a great move, which is attested to by the fact that all 4 issues have sold out! The next thing that comes to mind is the setting. Leading up to the comic’s debut, there was significant confusion surrounding the setting, canon, and continuity of the book. Flynn did not quite seem to be on the same page as the editors which produced some confusing contradictions at times, all of which, thankfully, have been addressed ad nauseam. After 4 issues, and multiple references, it is clear that the comic uses Sonic Forces as a jumping on point. Being the most recent Sonic game, and thus the most familiar to general populace, it was a major inspiration for the new book. Add to this the broad and general nature of the conflict presented in Forces, and you have an excellent structure upon which to build and expand. While it is obvious that the events of Sonic Forces occurred in this timeline, along with other past Sonic adventures alluded to in issue #1, the book clearly draws inspiration from other games, as well as its own original content. Altogether, this builds a world that will be familiar to fans of the various forms of Sonic media, but still uniquely distinct from them as well. To be perfectly clear for those who may still be confused: While IDW Sonic will borrow from and be inspired by various other Sonic games and media, it bears no connection to them whatsoever in regards to canon or continuity. Think of it as an alternate timeline that shares some events with the games, but only coincidentally. Furthermore, shared events may be changed or tweaked as the story demands to fill plot holes or lend a unique spin to the book. I have even noticed that while there are pretty obvious reference to Sonic Force strewn throughout each book, none of them are direct references. Sonic may talk about how he was captured, or the Resistance will talk about their efforts to clean up after Eggman’s defeat, but it is never overtly confirmed to be the same events that transpired in the game. Notably, Infinite, the Phantom Ruby, or the presence of Classic Sonic are not mentioned at all. These are all things Flynn has likely left out on purpose and will return to at a later point if deemed necessary to the story. It seems that while Flynn has left bread crumbs for fans to connect the dots, he does not plan on leaning too heavily on Forces either. Forces is not the only game to leave behind Easter eggs either, references to past games, memes, and even artist OC’s are tucked into almost every nook and cranny of the book! Sonic and friends perform an assortment of classic game moves from spins, peel-out, rolling dashes, and more. The artists draw enemy designs from various games, as well as putting their own spins on them. Each artist also snuck their own original characters into the general populace from Adam Bryce Thomas’s now infamous sheep girl, Lanolin, to Jen Hernandez’s characters held captive by Rough and Tumble. Evan Stanley even hid an homage to a “cursed image” meme of Sonic from Archie’s Sonic X series that in turn has gone somewhat viral itself! The care and attention to detail Flynn and the various artists have put into the book is a testament to how much they are fans themselves. Truly, they are part of the community too, and while the book was very accessible to newcomers, I am sure long-time fans felt serviced by the sheer amount of references and Easter eggs in these first 4 books alone! Even if all that went completely over your head, there is plenty of meat to these book to hook you. While at first glance, they might appear to merely feature a flavor of the week type formula regurgitated over and over, there is actually a lot to unpack within each issue. Flynn was very upfront about the fact that the first few issues will be focused on establishing characters, and fun, frenetic action beats rather than word building or heavy lore or plot development. And to be honest, there is almost no plot development whatsoever in the first 4 issues. Despite having gone on a fun tour country side and busting Badniks with an assortment of friends and allies, Sonic does not seem any closer to finding answers at the end of #4 than he did at the beginning of #1. This is again offset by the fact that we have been graced with 4x the normal monthly allotment of comics, and the fact that we will soon find out both the fate of Dr. Eggman in the next arc and the identity of the individual who has usurped his empire by the end of July! What little plot points we have been given rely mostly on solicitations from future issues in order to piece together anything remotely coherent, but it seems someone sinister took advantage of Eggman’s downfall in Forces, and filled the power vacuum he left behind, assuming control of his Eggman Empire. In the next issue, the Chaotix will be employed to find out what exactly transpired as Sonic seems to be making little progress on his own. Shadow is slated to make an appearance in the following June issue, assumedly with his own bone to pick with the doctor. All this will set the stage for the second half of year 1 and beyond as the villainous individual is finally revealed in issue #7. We know very little about this villain except that they seem to have similar goals to Dr. Eggman in destroying Sonic, as well as harnessing the power of the Master Emerald. We know they are intelligent enough to seize and control Eggman’s vast army of Badniks, and that even Orbot and Cubot recognize them as their new “boss”. Finally, we know from an interview with Ian Flynn, that this “antagonistic force” is one older fans might be able to “piece together early on” and that they are a “reference to something older”. Many assume this means it is some obscure villain from an older game, but the truth remains to be seen. Theories include: Metal Sonic, Eggman Nega, Infinity, or even Battle Kuku XV! As for Sonic’s true arch nemesis, we were treated to an ominous foreshadowing that Dr. Eggman has some nefarious plan to “fix” the apparent injustices done to him and take back his rightful place in the Eggman Empire. Unfortunately, that is about all we got plotwise, so far at least! Yet, in my opinion, that is OK because what the first 4 issues lacked in plot they made up for with character development in spades! Flynn did a great job of simultaneously reestablishing characters and showing off their individual fighting prowess in fun and inventive action sequences. We saw significant character growth from Tails and Amy alike, both showing a more mature and independent side of themselves without sacrificing those aspect that the fans have come to know and love. Tails still looks up to Sonic and feels like he has something to prove, but he does not need to necessarily tag along after Sonic and is confident enough to go out on his own. Likewise, Amy Rose seems to have grown out of merely being Sonic’s stalker, and while still clearly still head over heels for Sonic, understands that she needs to give him the space to be himself. Both are shown as intelligent and capable, complementing Sonic rather than just slowing him down. Knuckles and Blaze seem to need less development or at least significantly harder to write. Knuckles stays true to his game counterparts, possessing a strong sense of justice and a short fuse, making him tough as nails and quick to action, but easily baited and manipulated. Blaze is presented in a manner befitting her station as Princess of the Sol Zone. Regal, confident, with an aire of aristocracy, she uses her potent fire powers to decimate her foes without ever losing her cool. Each character is unlike the other, each filing a different role in this new universe and filling it richly at that. Perhaps more exciting still, was the introduction of three brand new, original characters: the villainous Rough and Tumble, and the heroic Tangle! Admittedly, I was greatly anticipating Rough and Tumble as characters, but was ultimately disappointed with the brevity in which we encountered them. While I appreciate the detour Flynn took to fit Wisps into the world, I would have rather dispensed with that in order to get to know these brothers a bit better. Thankfully, this will not be the last we see of them. Able to go blow for blow with Sonic and Knuckles, these skunks displayed a flair for the dramatic with their rehearsed introduction. Somewhat more ambitious than I previously expected, I was impressed they were tough enough to take over an entire town, and intelligent enough to hold it until our heroes showed up, even if there were merely content with tyranizing the locals. But honestly, we all know for whom the fandom was waiting: Tangle! Despite the continuous comparison to Sally Acorn, I do not think Tangle could be more different. True to her name, Tangle is capable, skilled, and brave, not hesitant to throw down and “tangle” with those threatening her home. Yet, she has a certain aloof and naive personality that shows she has not quite gone through the losses a character like Sally has. As I mentioned in my review of issue #4, if I was to draw a comparison between Tangle and a Freedom Fighter, it would be Bunnie. Like her, Tangle is optimistic, charming, and a formidable fighter, able to hold her own amidst the likes of Sonic and Blaze. Tangle also seems to lack a certain worldliness from being somewhat sheltered in her remote home town. She shows great amazement at the appearance of Blaze and her powers, granted that she is a pyrokinetic princess from another dimension! Of course, the axis around which all of these character interactions are revolving is none other than our titular hero, Sonic the Hedgehog! The majority of the interactions we see are between Sonic and some other individual, whether it be one of the nameless town militia members or one of his key allies. Outwardly, Sonic is carefree and casual, seemingly not taking things too seriously, yet on multiple occasions this vaneer is peeled away as he shows genuine concern for matters at hand and acts accordingly. He often uses his witty quips and jabs as a coping mechanism to mitigate dangerous or tense situations. He shows trust and loyalty for his friends, seamlessly working in tandem to face whatever threat is at hand, and while heroic in nature, he often asserts that things be done his way, though he is not unable to admit when he is wrong. He finds it hard to stay in one place too long, and needs to be free to race across the countryside on his newest quest. Witty, thoughtful, yet brash, this iteration is an excellent representation of the world’s most way past cool hero. Finally let us talk about the art! This arc showed the wide range of styles possessed by the creative team, each leaving their personal brand on Sonic, the character of the week, the townsfolk, and the Badniks, as well as the backdrops and action sequences. While I liked some better than others, each earned their place with the fans and were generally well received. Tracy Yardley reunites with Ian Flynn for the debut issue of the new run. While I dislike his B cover art, (I would have greatly preferred virtually any of the unused alternate designs that recently came out), I found his interior work to be good overall. While, his Sonic design somewhat irks me, his modeling of Tails was amazing. Likewise, his dynamic perspective angles, and excellent use of Sonic and Tails move pools, really won me over in the end. Adam Bryce Thomas’s issue #2 was the one I was anticipating most. His clean, crisp style has been my favorite since he and Flynn teamed up to do the Sonic Forces digital comics, and I have been looking forward to seeing more from him. Beyond his great character designs, ABT paints lush backdrops for his characters to inhabit. In issue #2, his town escapes the generic feudal aged walled city design that some of the other artists fell into, and conjures a quaint, rural town that fits naturally into the story line. Jen Hernandez’s cover work, was some of the best so far, but her interior work left much to be desired. The perspective angles did not seem as dynamic like they were in #1, and the character designs seemed to wax and wane throughout the book. Jen later admitted it was her first time doing her own inking and doing completely digital art, on top of not having drawn for a comic in some time, and ensured fans she she will continue working hard and learning. I have nothing but the utmost respect for her ability to not only take criticism on her work, but do so with grace, knowing she has greater potential. On a more positive note, her depictions of Rough and Tumble were spot on and wonderful, she did an excellent job of ushering in these two new characters. Finally, Evan Stanley had her work cut out for her, debuting not only Blaze and her fiery array of abilities, but the charming newcomer, Tangle! She did so in fine fashion, once again giving the battle an interesting backdrop with a town built around a hill. It was a treat getting to see the trio work in unison to fight off the most intimidating enemies we have seen yet, and seeing Tangle’s reactions to Blaze were priceless! While I appreciate the array of artists eager to come back and work on Sonic, I am looking forward to arcs being handled by one interior artist over a normal time frame. I can not imagine the pressure these four had in pumping out 4 issues for the very first month of a brand new book that was so highly anticipated by fans! That about sums it up! It’s been a wild ride, and I am sure many of you are going through withdrawals as I am waiting for issue #5 to drop at the end of the month! However, that does not mean nothing is going on in the IDW Sonic world, not by a long shot! The 2nd printings of issues #1-4 (as well as the 3rd printing of issue #1) will all be released this month! You will want to keep an eye out for #4 in particular which will have an all new variant cover by Evan Stanley and Matt Herms! In the meantime, let us know what you think? Do you agree with my assessment? What were your favorite characters or artists? Let us know your feelings in the comments below! Likewise, the Tidewater Comic Con in Virginia is coming up this weekend where the Superstar Variant of issue #1 by Edwin Huang will be available! Likewise, SDCC in July will have a limited edition issue #7 variant with a gold foil cover! If that is not enough, those who bought the SEGA Shop bundle announce way back at SxSW should be receiving them within the next week with a special variant of issue #4! Finally, with sales numbers for April set to come out tomorrow, we will be breaking them down for your edification, and seeing just how well the new book’s launch really was! We will be bringing you the latest information on all these things and more as they come, so make sure to check back regularly! Have a tip or idea for an article? Let us know! Thanks for reading! Until next time…Gotta Speed! Previous Special Limited #7 Variant coming to SDCC 18!